Owning an outdoor structure in your name is something we all crave for however, it doesn’t come by easily. This is why at Buildings 4 Less, we came up with our pilot program known as Rent to Own. This program makes it possible for you to rent one of the buildings at our disposal in a bid to own it in the long run. Note that, this program is still at its infant stage and can be terminated at any time, depending on the results we are able to get with it. We cannot be held responsible for the cancellation of the program at any time. However, if your rent to own contract and all paperwork with us is complete, you will not be affected by an abrupt stop to the program. Thank you for your understanding. If quality, satisfaction, and great customer service matter, then you’ve come to the right place. 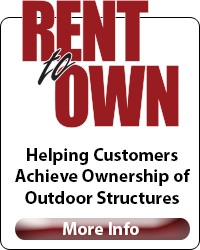 Call us on 318-422-9744 for a chance to own your own outdoor structure today. Gallery with ID 16 is empty. Notice: Rent to own down payments vary by the city and state of where your building is to be installed. North and South Carolina areas require a down payment of 25% of the sales price. Alabama, Tennessee and Mississippi only requires 15% down…..These examples are for Texas, Oklahoma, Louisiana, and Arkansas….and prices are subject to change by state, so please use these prices, down payments and monthly payments as guidelines. *Quoted payments above do not include monthly sales tax. This tax will differ depending on the tax rate at your installation location. Can pay off early with no penalty.